For a little over a year, I suffered from severe depression. It was probably the lowest I have ever been. I gradually fell away from God and did not want to "bother him" with my problems. He had more important things to do that deal with me. Probably didn't want anything to do with me anyway. I stayed away from everyone who was close to me. I would avoid all my friends at school because I was just sure they hated me. I would go straight to my room when I got home. One day… I don't remember what triggered it, but I had this idea; a play where a girl has this awful day and is mad at God. She has a dream and goes through His life. So I started writing. I finished the first draft in a weekend, and frankly I don't remember writing almost any of it. I’ve read words that I know came from my hand; but, somehow, not from me. 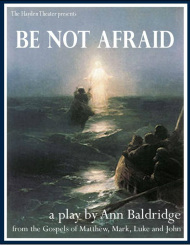 I truly believe that this play was the work of the Holy Spirit coming down to let me, and others like me, know that everything is going to be okay. After going to Mr. Radziejeski many, many times with different drafts and changes with my play, the only thing I needed was a good ending. What could Jesus say to make Kaitlyn and others like her feel better and comforted? Then Mrs. Leiker came along. She said this piece of wisdom that just sparked something inside me. I knew what I was going to write. Thanks to her and to Jesus Christ himself, I finished it. And know I ask you to sit back and enjoy the show. Thank you for coming and God bless.